The fifty year old brewery of Heineken in Den Bosch in the Netherlands, is located at no more then a fifteen minutes walk from the city centre. It has the appearance of a couple of huge green shoe boxes. 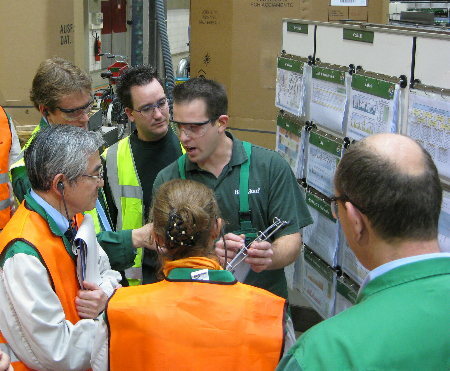 This production site received in 2009, as the first brewery of Heineken, an international accreditation from the Japan Institute of Plant Maintenance for its Total Productive Maintenance (TPM) program. Operators tell enthusiastic about their recent improvement efforts, during a TPM-audit by the Japan Institute of Plant Maintenance. What explains this success? ‘One important factor certainly is deployment’, says TPM-manager Age Posthuma1. At first, this only raises new questions! According to my dictionary, deployment is a military term for drawing up in battle array! Later in the interview, Posthuma hammers away at the need for discipline. Are the employees of Heineken drilled like soldiers? Fortunately for them, that is not the case. It is not the people who are lined up, but the Key Performance Indicators, from the management level to the operational level. Total Productive Maintenance (or Total Productive Management, TPM) concentrates on productivity improvement. TPM embraces at least eight management pillars. These are: (1) Continuous improvement, (2) Autonomous maintenance, to maintain is a task of everyone, (3) Planned maintenance (4) Training and standardization of the work (5) Early (equipment) management, maintenance and change-over procedures are taken into consideration when new equipment is purchased and/or designed (6) Quality management (7) Optimization of office processes (8) Safety and environment. 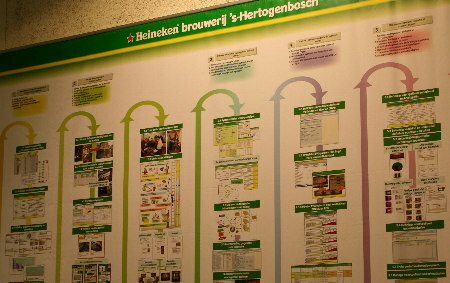 Within Heineken in Den Bosch there is a 9th pillar: internal logistics. In addition, Heineken places above all pillars a coordinating management pillar or cross bar, called focused improvement. Within this cross bar, the top level improvement priorities are determined, which give the TPM program direction. Via deployment, higher level goals are connected with lower level goals within specific pillars. In the end this cascade branches off into targets for Key Performance Indicators at the shop floor. Typical examples of annual goals are the improvement of the efficiency of the can production lines, the reduction of the energy consumption, and minimizing the extract loss, the quantity of beer that is spilled during production. During the last years, this percentage fell significantly in the brewery at Den Bosch, and loss of malt was reduced by 27%. During the flushing-process, before sending beer to the packaging lines, to much beer is directed towards the sewer. Later, when feeding of a packaging line is stopped, to much beer is directed to a vessel with residual beer and/or to the sewer. The program around the improvement teams is managed in a top-down way. This raises the question if there is also room for bottom-up initiatives. Fact is, that in Lean management it is often stressed that it is important that everybody, everyday contributes to the improvements! 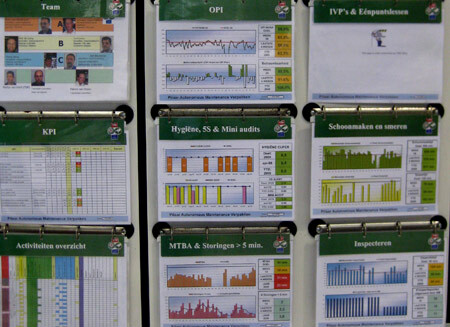 Machine boards reinforce the sense of ownership, and these boards give clear direction to the improvement program. Speaking of better alignment: In the years to come, Posthuma also wants to improve the power of Early Management. Roughly said, this means that a new machine is selected and installed in such a way, that the OEE of it is immediately as high as possible. So, change-over’s should be possible easy, and prior to installation autonomous and preventive maintenance programs are already developed. As the example above shows, there always remains room for further improvement! Nevertheless, the brewery in Den Bosch nowadays is seen as leading within Heineken, concerning the application of TPM. The audits don’t serve to breathe down to the neck of employees. The idea is to improve the contact between management and operations. ‘Therefore, also the improvement teams and the machine teams are audited regularly’. 1) Age Posthuma is no longer working within Heineken.